Our Road Trip to Orlando – Day 6 – The Ipes take a low key day to recharge | Tales From The Ipe! We had a grand day planned for Kennedy Space Center. Unfortunately 50 – 75% of the family was exhausted and that’s no way to enjoy a fun family day out at a Cape Canerval. Or anyone’s vacation day. Instead we decided to lounge around locally. We slept in (a little because we are not missing breakfast), slept a little, and the kids watched some tv and played Nintendo. We grabbed same takeout / ate leftovers for lunch, hit the pool, and washed our clothes in the hotel laundry room. Glad we brought some laundry detergent! The kids were definitely happy to have some downtime, and it was nice to spend some time by the pool. The kids also discovered that one of the arcade games was malfunctioning by not needing new tokens. Free games! In the late afternoon, we drove to a local amusement park that featured two large gas-powered go-kart tracks. Not only that, but they were multi-level. Ooooh aaaaah. It cost about $10 a person for Josh, Lily, and I to go racing. Fun for sure, and Lily was ecstatic that she is (barely) tall enough to finally ride on her own. I wasn’t sure they were going to allow her at the second, but the guy measured her again and let her go. Nums has some good pictures and video, I think, so I’ll have to grab them from her. Afterwards, we did some grocery shopping at a nearby Wal-Mart for supplies needed for the drive home. Drinks, stuff for sandwiches, and snacks. Really exciting stuff. We soon got home and got ready for our last dinner in Orlando. We went to Bongos Cuban Café in Disney Springs, which is partially owned by Gloria & Emile Estefan. Even with reservations, there was a long line to check in, and a bit of a wait as well. 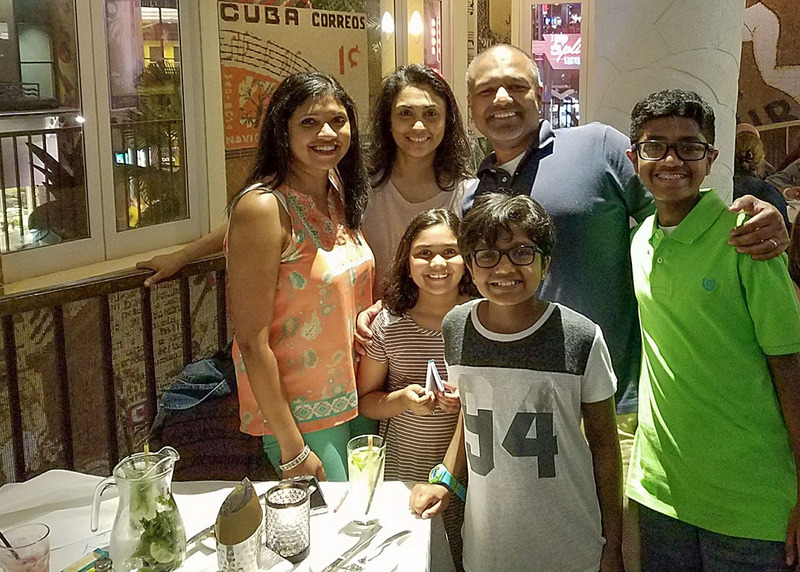 We somewhat expectedly ran into some friends from the Northeast who were also vacationing in Orlando this week, and were having dinner too. Dinner was good overall, but we probably ordered too much food. Josh barely touched his entree after appetizers. We also ordered a $38 pitcher of mojitos, which seemed like a value, but beers were only $6. By the time we got the check, I nearly fell out of my seat. Ah well. That was it. Our last big day in Orlando. Not exactly what we had originally planned, but it was fun anyway. This entry was posted in Trips and tagged orlando, road trip. Bookmark the permalink.